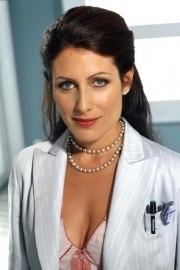 Dr. Lisa Cuddy, M.D., is a fictional character on the Fox medical drama House. She is portrayed by Lisa Edelstein. Cuddy was the Dean of Medicine and hospital administrator of the fictional Princeton-Plainsboro Teaching Hospital in New Jersey. She also becomes House's love interest through the years to start a relationship with him in season seven. Cuddy quit her job after the events of season's 7 finale. Cuddy's role in House is that of Dean of Medicine and hospital administrator. She is 43 years old, Jewish, and has a mother and one sister; her father died. She began dreaming of becoming a doctor when she was 12, graduated from medical school at age 25 as second best in her class, and became the first female and second youngest Dean of Medicine ever at age 32. Cuddy attended the University of Michigan, where she first met Gregory House , her future employee, with whom she shared a one night stand. Years later, when House suffered an infarction in his right leg prior to the beginning of the series, he was treated by Cuddy at Princeton-Plainsboro Teaching Hospital. Under Cuddy's care and the order of his Medical Proxy, House's then girlfriend of five years Stacy Warner , the dead muscle in his leg was removed against House's explicit wishes after he was put into an induced coma, leaving House with a permanent disability and chronic pain. After hiring House to run the hospital's diagnostics department, Cuddy began setting aside $50,000 a year from the hospital's budget for potential legal expenses. When, during the show's first season, new chairman of the board Edward Vogler tries to have House fired for refusing to kowtow to his demands, Cuddy urges the board to save House and remove Vogler instead, losing the $100 million donation he had made to the hospital. During the second season of House, it is revealed that Cuddy is trying to conceive a child. House agrees to administer the twice-daily injections necessary for her to undergo in-vitro fertilization, and to keep the matter secret. During the third season, Cuddy confesses to the hospital's Head of Oncology and House's best friend Wilson that she has had a total of three attempts at impregnation, one of which was miscarried. She is hurt when House, who is going through Vicodin withdrawal, tells her it is a good thing she has failed to become a mother, as she would be terrible at it. When House's career is threatened by Detective Michael Tritter , Cuddy commits perjury by falsifying documents and lying in court to cover up his wrong-doing. Cuddy questions whether House has a romantic interest in her when he interferes in her love life, interrupting her repeatedly during a blind date. When Wilson takes Cuddy to the theatre, and later to an art exhibition, House intervenes in an attempt to prevent Cuddy from becoming Wilson's fourth wife. Cuddy reveals during the fifth season that she is planning to adopt a baby, however is devastated when the birth-mother of the child she names Joy decides to keep her. House consoles her, and the two share a passionate kiss. Cuddy professes not to want a relationship with House, but is touched when he has her old desk from medical school brought out of storage for her when her office is renovated. In episode "Joy to the World", Cuddy becomes a foster parent and potential adoptive parent to a baby girl she names Rachel. She initially struggles with parenthood, revealing to Wilson that she feels nothing for Rachel, but soon after is able to begin bonding with her. In episode "Under My Skin" Cuddy helps House detox from Vicodin, and the two sleep together. In the following episode, fifth season finale "Both Sides Now", this is revealed to have been a hallucination on House's part: in reality, he spent the evening alone and is suffering from psychiatric problems as a result of Vicodin and emotional trauma. Throughout season six, Cuddy is busy in a relationship with a private investigator, Lucas and her adopted daughter. She's still caring towards House after he goes through his rehabilitation for Vicodin. She finds though that life is stressful with managing the hospital, as with the new additions to her life and House still having feelings towards her. Cuddy eventually tries to ask House to just be friends, but he refuses, saying that that is the last thing he wants. In the season six finale, House gives Cuddy an antique medical text written by her great grandfather, which prompts her to confess that she and Lucas became engaged the previous night. However, at the conclusion of the episode, Cuddy goes to House's apartment and announces she has broken it off with Lucas. She then confesses her love for House; the two share a tender kiss and lock hands in a surprisingly romantic gesture. Cuddy lied about her age, to make her two years older, when she began working at the hospital because she thought a lady in her early thirties, rather than late twenties, would get more respect. At the end of season 7, House crashes into Cuddy's house with his car. She resigns as Dean of Medicine after this event. Whole or part of the information contained in this card come from the Wikipedia article "Lisa Cuddy", licensed under CC-BY-SA full list of contributors here.